The Combined Cadet Force (CCF) is an important aspect of the Wellington Academy life. Contingent Commander who is responsible for the CCF here at the Academy, provides an overview of what life is like in the CCF. The CCF is a voluntary youth organisation based in schools and colleges sponsored by the Ministry of Defence (MoD). It’s known as the ‘combined’ cadet force because it can comprise of the three service sections - the Royal Navy, Army and Royal Air Force. The Academy CCF is sponsored by 26 Engineer Regiment, Royal Engineers and proudly wears the Sapper cap-badge. The broad role of the CCF is to provide a disciplined organisation in a school setting so students can learn about the Armed Forces and develop their leadership skills through training which promotes the qualities of responsibility, self-reliance, resourcefulness, endurance and perseverance. 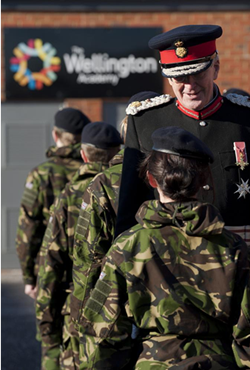 The CCF is run by adult volunteers from the staff of the Wellington Academy. They receive training from the relevant service to teach the CCF curriculum These volunteers are supported by the School Staff Instructor (SSI) Captain Carey, an ex-senior rank whose office is in the CCF building. What kind of activities are the cadets involved in? The syllabus is 60% military training and 40% adventure training. There is also the opportunity to be part of The Duke of Edinburgh Award Scheme. The CCF normally meets or parades every Thursday afternoon at the end of the school day for 1½-3 hours. They also undertake additional activities at weekends and there’s the opportunity to go on organised camps and adventure training weeks. The syllabus is designed to ensure students get the most out of it and have lots of safe and challenging fun. From September 2014 Year 9 students have the opportunity to join the CCF on a Thursday afternoon from 1315-1600hrs as part of the Enrichment Programme. When can I join the the Wellington Academy CCF? Students who are keen to get involved from years 9, 10, should contact Capt Carey for an application form, or pick one up from the CCF building. What are the main benefits of the CCF? In a nutshell it’s an activity within school which allows young people to be challenged in ways that they don’t get out of any other single activity. It brings together military training and adventure training, with the opportunity to work as part of a group, exercise and build endurance and self-confidence. You will make great new friends, try lots of new things and have great fun doing it.